The Google Pixel XL, and its smaller sibling the Pixel, were released in October 2016. At the time of their launch, they were lauded by many as the benchmark for other Android phones. Samsung at the time was still dealing with the debacle that was the Galaxy Note7 while companies like Huawei had solid phones but less-than-stellar user experience in EMUI 4.0. Even the younger kids on the block like OnePlus were touting their phones but from an overall experience, none of them matched the Pixel XL. Fast forward six months. Is the Pixel XL still a benchmark device? In my opinion, absolutely. It is from many perspectives: Performance, photo quality, and perhaps most importantly, the upgrade experience. If there is one thing that the Google Pixel lineup offers that virtually no others do, it is a pure, as Google intended it, Android experience. Others are close – Motorola and OnePlus – but none are unadulterated Android. When the Pixel was announced, the immediate response was “iPhone copycat” and, to be fair, it is a bit true. If you hold a Pixel up to an iPhone 7, minus the Home button, they look strikingly similar on the front. Is that a bad thing? I don’t think so. Apple, love them or hate them, has done a great job of selling iPhones these past few years and it is a proven look for a smartphone. Unlike deep dive reviews of phones I’ve done here on the site, I’m not going to do that with the Pixel XL. Instead, I’m going to highlight three key areas that I think make the phone a benchmark by which to measure other phones in the market. You may feel different, and that’s okay. We are all adults and can have a healthy debate on it. then and remains so today. If you run the Pixel XL through the Basemark OS II hardware testing app, the Pixel XL renders a score of 2901. That score is only beat by the new Huawei P10 and P10 Plus, the Huawei Mate 9 and the OnePlus 3T if you compare it to scores from the app collected by GSMArena. All four of these phones came after the release of the Pixel lineup so, as you would expect, it would get topped at some point. But it took really until the P10 for it to be properly beaten and that phone was announced in February of this year. Equally, I made the point in my review of the P10 and the Mate 9 that I personally think the Kirin 960 processor in those phones could be the best in the market today. My point here is that it took months for the Pixel phones to be outclassed when it comes to benchmarked processing power. Considering that you could arguably measure the life of a smartphone in dog years, that’s a pretty good run at the top. Let’s take it a step further. If you compare the benchmark tests of the Pixel and the last Nexus phone, the Nexus 6P, it is a quantum leap. The 6P scored 1399 points in the the Basemark OS II testing, some 1502 points lower than the Pixel. That is a big performance improvement in the Google phone lineup and you can feel it. My Nexus 6P never felt slow – until I compared it to the Pixel XL (and later the Huawei P10). Now, it feels sluggish even under not-so-intensive application usage. Don’t get me wrong, I’d still recommend the 6P if you are looking for a phone that doesn’t have the price tag of the Pixel lineup (truthfully, look at a Mate 9 or P10). But when it comes to pure power, the Pixel is awesome. The other big news when the Pixel lineup was launched was the camera. It didn’t top the world with megapixels but it did in overall it has a huge sensor at 1.55μm pixels and is the highest rates mobile phone camera ever by Dxomark. It’s not hard to figure out why. I’ve shot photos with my Pixel XL in a wide range of scenes and lighting conditions and it is unbelievably good. I’ve not found a situation yet where the camera was anything less than superior to anything I’ve ever tested. Even the vaunted 20MP shooter that is on the Huawei P10 couldn’t handle low light and bright light situations as well as the Pixel XL. Sure it has more megapixels but the sensor is smaller – thus you don’t end up with the details in low light. But this isn’t just my opinion. If you do a Google search for reviews of the Pixel lineup, more specifically on the camera, you will find that every reviewer or site out there raved about the camera. In my research for this article, I could not find one proper review of the phone that said anything disparaging of the camera. To get independent writers like me and those who work for larger news organizations to, unknowingly, agree on anything related to a smartphone feature is a small miracle. That speaks volumes about this camera. Google, of course, knew they had a winner on their hands and they upped the ante a bit more with their decision around Google Photos. Normally, if you upload photos from any other device, including the Nexus phones, in original quality, you take a hit on your Google Drive quota. Remember, Photos stores in your Google Drive account so it is all one big pool of storage. To get around this, you can upload in High Quality. This compresses your photos but, to be fair, anything less than 16MP in size, you simply won’t see the difference. Google has some almighty compression algorithms going on. This changed on the Pixel phones. If you have a Pixel or Pixel XL, it comes with Google Photos and there is no option to upload your photos in High Quality. All your photos are uploaded in Original Quality but, and this is a big but, they don’t count against your storage quota. That means, in theory, if you have a Pixel and have the free 15GB of storage in Google Drive, it could last you forever because now your photos don’t count against storage limits just like Google G Suite files (like Docs and Sheets). If you are an avid photographer with your phone, that could save you quite a bit of money over the course of a year. At the end of this article I’ve posted a gallery of photos that I’ve shot with my Pixel XL. None of them are going to win awards but they will give you a sample of what you can expect from this camera. All of them are unedited. I’ve also posted a 4K video I shot with the Pixel XL over on YouTube. If the overall performance isn’t enough to convince you that the Pixel lineup is still a benchmark, or the camera, then the fact that this phone stays up-to-date continually should be the ticket. When the Pixel lineup launched, it didn’t launch with plain ‘ole Android Nougat. No, it launched with its own flavor, Nougat 7.1. It was the first phone with that build and now bumped up to Nougat 7.1.2. The bigger fact, as most readers know, is that Google updates their own devices first before other manufactures or carriers get to updates out. So what does that really mean? It means that I’m running Nougat 7.1.2 on my Pixel XL (as well as my Nexus 6P which is in the Android Beta program). On my Pixel, I received the update the day it was released, literally a few hours after it was released. That same day, as part of the same update, I received the April Android Security Update. If there is one huge knock in the Android ecosystem it is the delay or lack of updates of devices from manufactures. Some are better than others. HTC for example, generally has their updates out within a few weeks of it being released by Google. Samsung? Huawei? Yeah, good luck. Those two are notoriously slow about getting updates out although signs indicate this is improving. Then you layer in the carriers who take their time testing updates. All this adds up to devices that are vulnerable to attack (that is why Google releases a monthly security update) or doesn’t have the latest features that Android has to offer. I’m not dismissing other devices – far from it. I personally like Huawei devices and I know there are dozens of readers who use Samsung, LG, BLU and HTC devices. But when it comes to updates, Google and the Pixel lineup are supreme. Things are changing for the better in this area. HTC is an afore mentioned highlight and Huawei, LG and Samsung are all improving. Would I Recommend Buying a Google Pixel Now? The short answer is yes. I fully appreciate that rumors of the Pixel 2 (or whatever it will be called) are floating. I also appreciate that these new phones will likely be available in October, five months from now. So it really comes down to your buying cycle. If you are at a point where you are looking for your next phone, give the Pixel or Pixel XL a serious look. 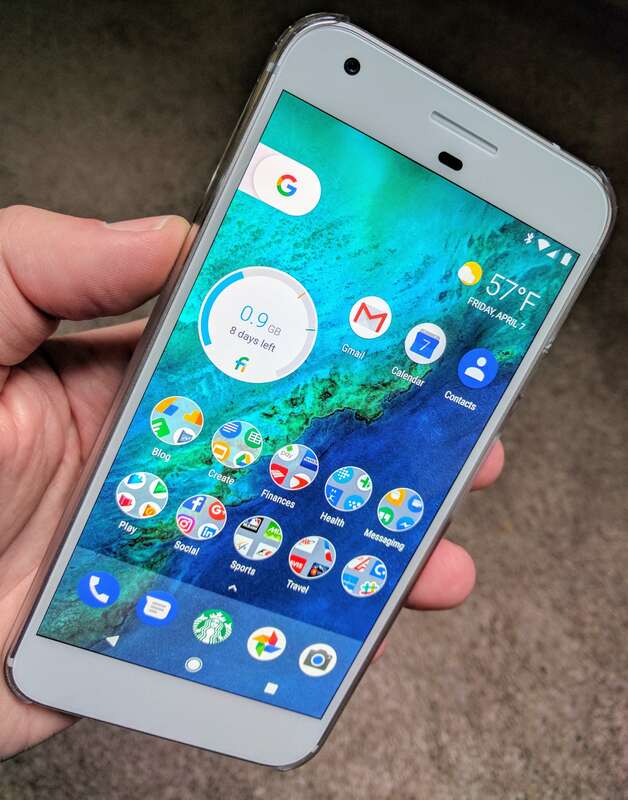 For all of the reasons I’ve pointed out in this article plus things I didn’t cover: Solid construction & design, the fast Pixel Launcher, excellent display and PPI, solid (but not the best to be fair) audio quality… and a phone with a “G” on the back. If, however, you are still 6 months or a year away from an upgrade, no. Wait. Wait until the Pixel 2 is available and see if it meets your needs. I suspect there will be improvements in some key areas and it could well be a nearly bezel-free design. Regardless if you wait or get a Pixel, it is a benchmark to compare other devices against on a multitude of levels.